MEMOFIN - Principles for the Regulation of Exchange Traded Funds - L'information financière que vous ne trouvez nulle part ailleurs ! There is increasing interest in ETFs worldwide as evidenced by the significant amount of money invested in these types of products. The dynamic growth of ETFs has also drawn the attention of regulators around the world who are concerned about the potential impact of ETFs on investors and the marketplace. The IOSCO Committee on Investment Management (C5), in the course of 2008-2009, decided to carry out preliminary work into the ETF industry. Responses to a questionnaire sent to member jurisdictions and subsequent hearings with industry representatives confirmed the value of further policy work to assist national regulators in addressing potential issues. In 2010, C5 sought the endorsement of the former IOSCO Technical Committee (TC) – now the IOSCO Board – for a policy initiative to establish a common set of principles of value for regulators, industry participants, and investors alike. If appropriate, develop a set of principles or best practices on ETF regulation. In order to carry out its mandate, C5 established an ad hoc working group, co-Chaired by the French AMF and the US SEC, and comprising the following C5 Members: the AMF of Québec, the Ontario Securities Commission, the Swiss FINMA, the German BaFin, the Hong Kong SFC, the Italian CONSOB, the CSSF of Luxembourg, the Central Bank of Ireland (CBI), the Spanish CNMV and the UK FSA. Consistent with the mandate of C5, these principles address only ETFs that are organized as CIS and are not meant to encompass other Exchange Traded Products (ETPs) that are not organized as CIS in a particular C5 Member jurisdiction. Accordingly, unless otherwise noted, when used in this paper, the term ETF refers only to an ETP organized as CIS. As ETFs are CIS, C5 notes that work done by IOSCO with respect to other areas of CIS regulation are also applicable to the management and operations of ETFs. 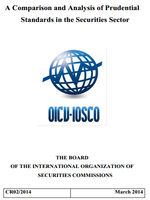 Therefore, in this paper, C5 chiefly identifies principles that distinguish ETFsfrom other CIS, reviews existing IOSCO principles for CIS, and adaptsthose principles to the specificities of an ETF structure where relevant. More general recommendations are made where concerns are not exclusive to ETFs or to securities markets regulation. The aim of this report is to outline principles against which both the industry and regulators can assess the quality of regulation and industry practices concerning ETFs. Generally, these principles reflect a common approach and are a practical guide for regulators and industry practitioners. Implementation of the principles may vary from jurisdiction to jurisdiction, depending on local conditions and circumstances.